Generally speaking, all the various integrated safety technologies equally fulfill safety requirements. They are all based on the “Black Channel” principle, listed in the IEC 61784-3 standard and certified up to SIL 3. Hidden behind the raw safety aspects, however, are relevant criteria that define whether a technology will be adopted by component manufacturers or end customers. The distinguishing differences are the ease of integration of the technologies in the application serving the problem-solving purpose at hand. 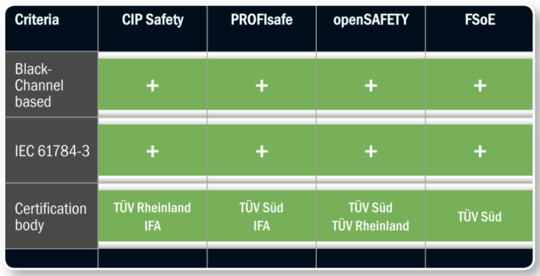 openSAFETY technology is certified up to SIL3. Though it has not been qualified yet, the core principle of this technology, including probability of failure on demand (PFD), is ready for SIL4.